Calls from Microsoft, contextual advertising, encrypting a hard drive, slack space & a new family member. If you have a tech question, Ask it here. Newsletter subscribers using that link go to the head of the line. Questions about the newsletter? Check the newsletter administration page. You can also unsubscribe using the link at the bottom of this email. The latest newsletter is always available online at http://ask-leo.com/currentnewsletter.html, where you'll also find links to complete archives. A family member got scammed via a telephone call from someone saying that they were from Microsoft, calling because of PC error reports. Unfortunately, remote access was given. What should be done to prevent further compromise of the PC data? Help! Note MS scanner and a Norton scan were done and showed no problems. Remote access software files were removed manually from PC. Could the scammer again access the PC data? Data is backed up to external drive (not plugged in at the time of the scam). Can the same files/data be safely loaded on to a new HD/computer safely? As you point out, it's a scam. Microsoft doesn't call people because of errors on their computer. Neither do ISPs, security companies, or pretty much anyone else who might claim some role of internet authority or otherwise. I've been getting lots of reports of this scam and its variants of late. Fortunately, many people are rightfully suspicious and cut it off before it goes too far. Unfortunately, having fallen for the scam puts you in a difficult and dangerous position. What is contextual advertising and how does it affect my privacy? I feel like I'm being stalked. I see the same ad all over the place. The thing is my wife doesn't; she sees normal ads on the same pages that I see this stalker ad. What's going on? People get pretty wrapped up when it comes to advertising, particularly anything that uses the word "tracking." They feel - as you probably do - that someone is tracking them specifically. Well ... yes and no. Advertisers and advertising networks use as much information as possible to provide advertisements that are relevant to you and your needs. Sometimes, that might look like they're following you around a little. I see the most common example right here on Ask Leo! I'll use that as a place to start. Continue reading: What is contextual advertising, and how does it affect my privacy? How do I encrypt a hard drive using TrueCrypt? I realized the other day that the external hard drive that I carry with me when traveling was an easy thing to lose. Now, much of the data on that drive is encrypted in various ways: some files are explicitly encrypted backup archives created using 7-zip and others are encrypted TrueCrypt volumes. But the vast majority of whatever is on that drive is unencrypted. In a forehead-slapping moment, I realized that I was going about this all wrong. I should encrypt the entire drive. Continue reading: How do I encrypt a hard drive using TrueCrypt? If I have all the recommended security in place, is my computer safe and un-hackable? If my Windows firewall is active, my line through my USB modem is authenticated and encrypted, and I have anti-virus and anti-spyware installed on my device, does that mean that I am safe and my laptop cannot be hacked? First, let me say good on you for having all of those security measures in place, knowing what they are, and being aware of security in general. That alone puts you well ahead of many. I get variations of your question frequently, so I'm going to address it and a few of its related issues. Why it's "no", after having everything in place as you describe, requires a little explanation. Continue reading: If I have all the recommended security in place, is my computer safe and un-hackable? Unsecured routers and access points represent a larger security hole than most people realize. Besides WiFi snooping, malware on your computer can access unsecured routers, completely circumvent the router's firewall, and put into place hidden redirections that can even compromise SSL connections. In this video excerpt from an Ask Leo! webinar, I'll walk through some of the more important steps to secure your router and access point by showing you the settings on my own. I had been fighting two rootkits and as many as a dozen Trojan Horses for almost three months. None of several anti-malware programs have any effect on them - most did not even see them. Microsoft Standalone System Sweeper took care of them all with one sweep. I have been free of the malware for three weeks and the effects that they had on my computer are gone. Not a good explanation of the error. The error can appear on one computer but not another when accessing the same site. I am having that problem now. My desktop gets the error, the laptop works fine. Nonetheless, it is an error on the server, not your machine. Something different (probably a very innocuous and benign difference between the two machines) is somehow causing the remote server to fail. There's no way to tell what without being the server or website owner. On the question of security for cloud/internet services, the only safe assumption that you can make is that your files are totally available to anyone on the internet. The article has mentioned most of the ways that your information can be exposed. One way not mentioned is not knowing exactly where your information is stored. For example, if you live outside of the US, you may assume that your data is safe from US government/legal system prying (or it could be any other nation). But there are many ways that your data may become exposed to them without your knowledge. For example, although the TLD is your national one (i.e. Google.UK), the server is actually hosted elsewhere. Another example is even if your server is hosted locally, it's disaster failover site may be in another country. Finally, their offsite backups may be stored in another country. If any form of your data resides in some other country, their legal system can grab it. So, if you have any sensitive information, personal or corporate data stored on the net, it is not secure unless you apply encryption to the file yourself, BEFORE it is uploaded to the internet. All unecrypted data, regardless of what legal (contract or local legislation) or technical (ie HTTPS) protection you may think you have, you DON'T! Nice info. Now I know what the two bytes at the beginning of QBASIC.HLP stands for. :-) The contents of the file seems to be compressed, as it is garbled and contains a word list of some sort. I wonder whether it is compressed using one of the compression algorithms that you got patents for. It is indeed. U.S. patent 4,955,066 and a subsequent one cover the compression algorithms developed for that help system. The word list that you see is a list of frequently occuring words that are replaced by shorter tokens in one phase of the compression. The fact that I'm recommending a free email service at all will come as a shock to most of my long-time readers. I've long ranted against using free email services as the sole repository for your important information. Most people read that as being "against free email", but it's really against putting all your eggs in someone else's basket and only in someone else's basket. Free email accounts have a place in your overall email strategy. And one of the reasons why I recommend GMail, Google's free email service, is that it allows you to take control of your email in ways that the other services will not. In fact, I can see situations where GMail might be your primary email account. Just never your only email account. Moving from one email provider can be extremely difficult, yet it's not that uncommon to want to do so. How do I transfer my email from one ISP to another? I have a btinternet account and I want to transfer all my emails and folders from that account to a Yahoo Canadian account? How would I go about that? I'm going to assume that you use your ISP's web mail of some sort, as opposed to downloading your email into a mail program on your PC. The problem here is that web-based email - be it your ISP, a free email service like Hotmail, or something else - is extremely difficult to move from service to service. In fact, I'll go so far as to say that as a practical matter, it might just as well be impossible. But I do have a suggestion. This week's Securing Your Router is an excerpt from last month's webinar. I hope to have another segment up sometime this week as well. The next webinar is this coming Sunday. Hope you can make it - more information here. We have a new addition here at Ask Leo! 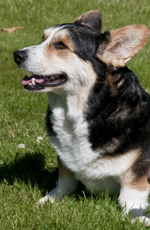 world headquarters: Chester, pictured at right, is a four-year-old Cardigan Welsh Corgi. His former owner had to give him up for health reasons, so the breeder (a good friend) gave us a call. Technically, he's here as a test to see how things will work out, but if the past couple of days are any indication ... well, let's just say he's very probably home. One of the reasons why we got the call is that Chester is the son of our other Cardi, Dagmar. Pembroke Welsh Corgis Helen and Sammy round out our pack. And a pack it is ... there's just no sneaking into our house.